Coneflowers rank right up there with black-eyed Susans as my favorite native summer flowers. I planted six coneflower plants in our new front bed this past spring. As the flowers have begun to dry on the stalks, I’ve been snipping some of the heads and leaving them in the bed to multiply. I’ve also begun drying and harvesting seeds to sow in other areas of our garden and to share with friends. 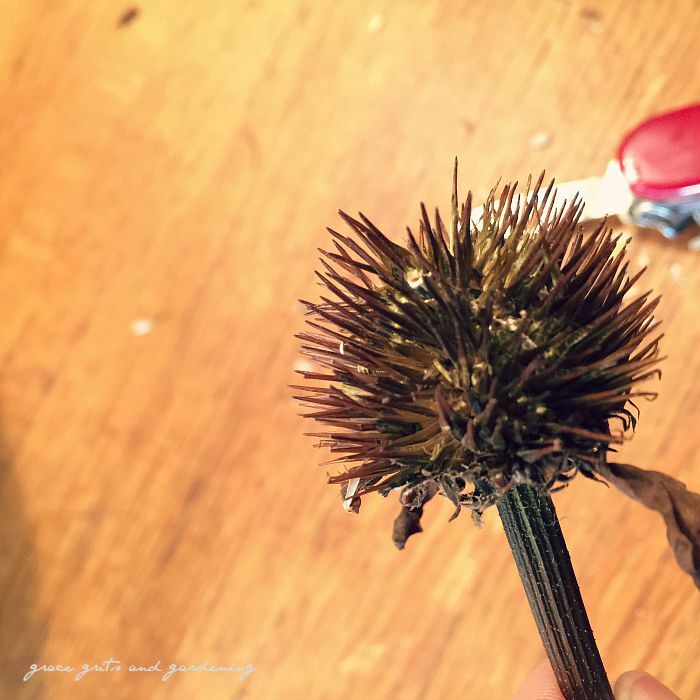 Today I’m showing you how to harvest coneflower seeds. And FYI, if you look closely you’ll see a dried sunflower in the picture above, as well as a random red flower that a neighbor left in our Little Free Library seed exchange drawer. A variety of aster? Sometimes it’s hard to tell after it dries. The point is, what I’m about to explain will work with a variety of flowers. 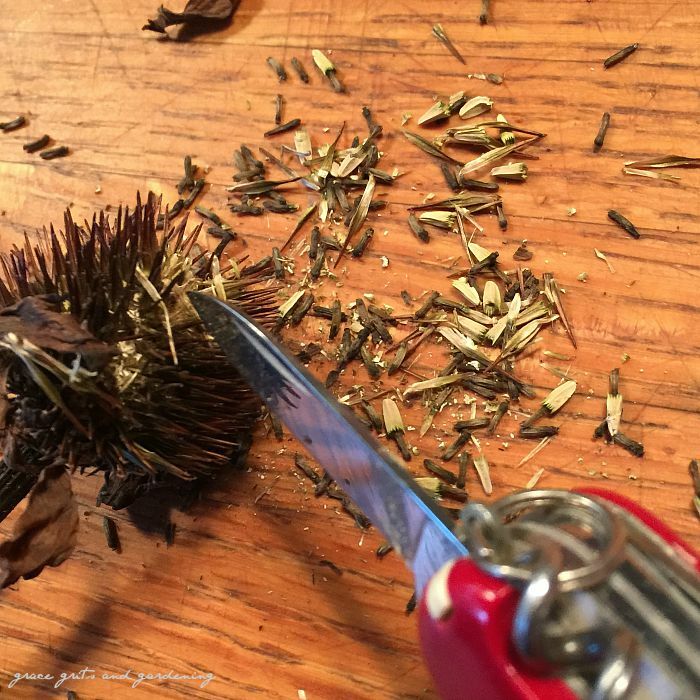 I used my handy dandy Swiss Army knife to urge the seeds from the dried flowers. The center of the flower is spiny and prickly, so I recommend you use some sort of knife or similar object rather than your fingers. Scrape and scrape. The seeds are buried inside the cone and look much like grains of rice. The darker part (in the picture above) is chaff or the seed covering. Toss that part to the compost. I tried my hand at videoing this process. Watch it if you’d like to see my live ramblings. I made labels for my plastic bags, which I thought turned out pretty cute. 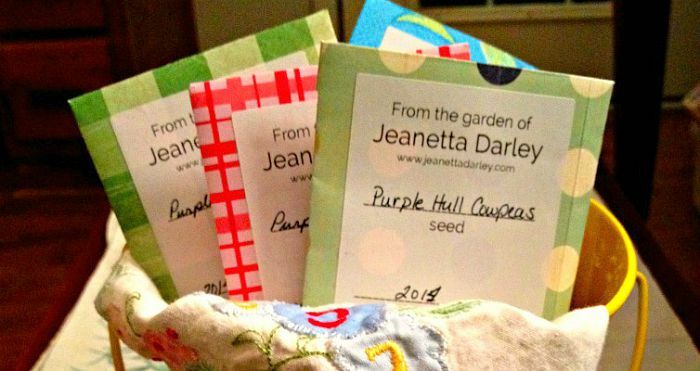 Earlier in the year, my blogger friend Jeanetta Darley made seed storage bags for the annual Faulkner County seed swap. So creative! Her blog post (click HERE) includes a template and step by step instructions. By the way, Jeanetta is a wonderful gardener. If you are on Periscope, follow her @JeanettaDarley—she often scopes from her lush garden, and seeing it is a real treat. Maybe it’s just my personal weirdness, but harvesting coneflowers is addictive. Not that I’m wishing my life away, but I can’t help but imagine how these seeds will grow into full blown coneflowers next summer. And in five years time, oh my. Jack and the Beanstalk magical! Anyone want seeds? I’ll be sharing packets soon in our Little Free Library. Good job! Great to hear your voice! Thanks, Paula. Probably won’t be a regular feature – LOL. Hey…I had some sunflowers this year. How do you harvest them for eating? This same way, Kayla. Once you remove the seeds, you can eat them as is or lightly toast them in the oven. Great job Talya! Loved hearing your voice. Tom is outside deadheading my coneflowers right now. He will spread the seeds in his field that is in a conservation reserve program.